There is no question about it — country music has experienced a major shift over the last few years. Instead of relying on three chords and the truth as a general rule of thumb, the genre has come to rely on reinvention, sub-genres, and envelope-pushing in ways it never has before. To some it is a generational evolution and an inevitable reflection of “the times changing,” but to others it is a rather tragic and extreme turn. With that being said, oftentimes newer artists are called “too pop,” “too rock,” or accused of not singing and just “talking to music,” and, let’s be real here — a lot of those accusations are laden with truth. Along with the twists and sharp turns has come a widely open door to artists from other genres to come try a hand at country music, and whether those artists have peaked or valleyed in Music City is another story. Fact of the matter is, they felt comfortable enough to enter the realm and give it a whirl. Thus, with the newer, less traditional artists in play and the experienced musicians dipping their newly cowboy boot clad toes in our waters, it made us think about who else could knock on Nashville’s door. Of course, with that question, two obvious words came to mind: Snoop Dogg. Before you click that “X” at the top of your tab or window, let’s discuss. Believe it or not, there have been many times the D-O-double G has been more country than you and me, and he occasionally has the legends by his side to prove this. Grab yourself some gin and juice and check out the evidence. In 2008, Snoop released a song called “My Medicine.” In discussing the track, he paid homage to the late, great Johnny Cash. In fact, he called the legendary country singer “a real American gangster” and shared with People that “[h]is music touched people like myself, which you probably didn’t know.” The music video for “My Medicine” was filmed in Nashville, showed the rapper on the Grand Ole Opry stage, and featured three country music artists — Willie Nelson, Brad Paisley, and Julianne Hough. Neither artist has hidden the fact that he likes to smoke on occasion (or more often than that). Perhaps that is why they flocked together and found an unlikely friendship. The two have collaborated more than once in their careers, but nothing put a bow on their relationship quite like Snoop’s recent Christmas gift to the iconic Nelson. This made us so happy, we can officially chill…till the next episode. 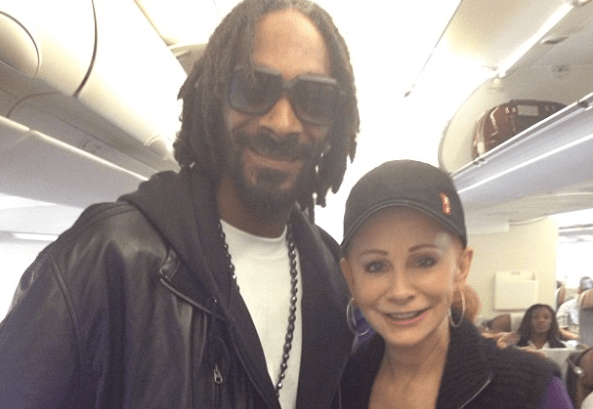 Granted these two don’t have quite the bond Snoop and Nelson have and maybe they don’t text every day, but when two superstars are aboard one flight, there is a connection and understanding that we laypeople can’t quite comprehend. And, let’s be honest, you have to tip your hat to the rap star for appropriately saluting McEntire and calling her a legend when he posted a photo of the pair on a plane. Was on plane wit a legend Reba !! Cmt style. In a college football national championship that might not have ended the way a lot of spectators expected, it was the pre-game performance and post-performance tweet that had us the most surprised. Trust us, we thought Little Big Town absolutely blew the National Anthem out of the water and we couldn’t be more proud to have the group represent the genre, but we certainly did not anticipate the nod of approval from the dogg house.